Maintaining incorrect posture whilst you are sitting at your desk all day can be a serious problem. It can cause a bad back, pains in the legs and feet and even neck injury. For this reason, it is important to make sure that you have a good quality office chair to sit at that will provide the best possible support whilst you are working. Have you thought about your posture recently? You should ensure that you are sitting all the way back in your chair, and the backrest should be high enough to not only support your lower back but ideally, it should support your neck and had too. Whether you’re looking to replace an existing office chair or if you want to buy a brand new chair for your home office, you will be sure to find some great suggestions here. When you buy an office chair, it is important that you look for the features that will make it as ergonomic and as comfortable as possible. There are many considerations that you will need to make, so let’s take a look at some of the features that you should check out. Whenever you buy an office chair, you will notice that it has some kind of covering over the cushions, whilst some of the more basic office chairs may not have any cushioning at all. Whilst the shape of the chair and the amount of cushioning that it has are very important when it comes to ergonomics, you should also be sure that the material covering the cushioning will be comfortable and that it will also provide support. The main types of material that you can expect to find on office chairs includes leather, Faux Leather, Vinyl, Mesh, Fabric, Plastic, and Wood. Let’s take a look at the various properties of these materials to see which one would be best for your office chair. The feel of your skin is important. If you are wearing a short-sleeved shirt, for example, your arms will be exposed to the material. 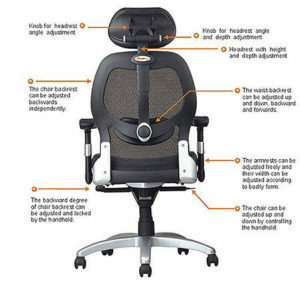 At the top of the back of the chair, you may also find that your neck is also exposed to the material. Leather has a luxurious and hardwearing feel. It can sometimes be a little cold to the touch in the winter and if it is in direct sunlight, in the summer it can become unbearably hot. You should bear this in mind when you are making your decision. If you don’t have an air-conditioned office, a real leather chair may end up being an uncomfortable commodity in warmer weather, as leather does not allow air to flow through the material. Cleaning a leather chair is simple. You can simply take a damp cloth and wipe the leather clean. It is also fairly stain resistant. As leather is so strong, it can provide support to the chair’s structure and will keep the padding firmly in place. It is also very durable and you can be sure that a leather office chair will last for a long time. Mesh office chairs do not contain padding like some of the more luxurious or executive office chairs, but instead, a strong mesh is used to form the backrest. This material is highly breathable so you can be sure that it will be comfortable when you sit in it and you won’t be too hot or too cold. Thanks to the strength of mesh material, you can be sure that it will hold shape well and can be strong enough to be the backrest of the chair. This can keep the unit cost of the chair low so that you pay a reasonable price for it. One of the problems with mesh, however, is that it can lose some shape over time and so it may need to be replaced sooner than some alternative chairs. Due to the mesh construction, these chairs are often easy to keep clean. Some do come with a cushioned seat pad, however, and so the seat pad may not be as easy to clean as the mesh backrest. Fabric cushion coverings can range from being economical to luxurious. There is no definitive type of fabric that is used for fabric upholstered office chairs, so for this reason, it is less likely that you would be able to predict the quality of the material before you buy. Generally, the fabric used on office chairs tends to be quite strong. It doesn’t offer much support, however, so you’ll find that most of the support in fabric-upholstered chairs actually comes from the frame and the padding. When you sit on a fabric chair, it will never be too hot or too cold as fabric feels the same temperature at all times. It is also breathable. The main problem with fabric is that it is hard to keep clean. If you eat your lunch at your desk, for example, you might want to avoid choosing a fabric chair. You should bear in mind that fabric is difficult to clean when you are choosing the best color of chairs for your office. Fabric chairs can last for a long time if they are good enough quality, but most of the time, you get what you pay for when it comes to fabric office chairs. Although you won’t find an office chair that is made entirely from wood, you may find one that has a wooden frame. Wood is a traditional material to use in the construction of office furniture, and if you want all your furniture to match then you may consider choosing a wooden office chair. The main problem with wooden office chairs is that the frames are glued and screwed together. This does not make the joints particularly strong, so if you are a heavier user, or if you use the chair for longer lengths of time, you may find that the frame won’t be able to last for very long. Wood can also be quite strong, but when it is used as a frame for a chair, it is more likely that the wood will be of an inferior quality. This results in a frame that is not as reliable as a metal frame. Whilst there are some chairs that are available to buy that are made almost entirely from metal, it is not likely that will be a good idea for your office needs. Metal isn’t a comfortable material to sit on for prolonged lengths of time, although it is hard wearing and durable. The metal material is more likely to be used in the production of the frame, and for this, it is very effective. It is strong and durable and you can be sure that it will be able to hold your weight, even if you are taller or have a larger figure. The problem with metal is that it is heavy, expensive and can be cold to the touch. These kinds of chairs are often quite stylish and comfortable. When you want your guests to be able to sit comfortably whilst they wait for you to become available, it’s important to ensure that there is a pleasant seating area available. Guest office chairs are not usually mounted on wheels and instead have four stationary legs. They are usually designed in a square shape to that they can be positioned beside another chair to make a row of seating if necessary. If you want to look like the boss in your office, what you need is an executive office chair. These chairs are very comfortable and come with plenty of high-quality padding and strong material to ensure that you are seated in the best possible position. An executive office chair is usually larger than most other kinds of office chairs and also has a high back. These chairs can often be adjusted in many different ways, including seat, back, height, arms, and tilt. If you’re looking for the most comfortable office chair, check out the link! As conference rooms are a place where influential decisions need to be made, it is a good idea to ensure that conference chairs are used. These are similar to executive chairs but they are extremely easy to move around. This is important for when the room is being set up and to allow the users to move around freely on the chairs too. They usually have fewer adjustable parts and instead, are set in a stationary position with height adjustment only. This ensures that the user can sit comfortably for prolonged lengths of time without needing to adjust the chair when they first sit in it. For workplaces or offices where space saving is necessary, stacking chairs are a great option. These chairs are designed to be stacked together so that they can make space if all the chairs are not needed. This can be especially useful in multi-function rooms where the room is used for different purposes at different times. You don’t always have to choose an office chair in order to improve your posture and reduce back pain. Although they may not be as comfortable as regular office chairs, there are plenty of alternatives to choosing a chair for your office. An exercise ball could be used in place of a chair. There are many offices, such as physiotherapy offices, where the staff will use an exercise ball in place of using a standard office chair. When you balance on one of these balls, you will have no choice but to sit up straight in order to keep your balance and to feel comfortable. This can be very helpful for those who have back problems and need to improve their posture. Kneeling chairs do not have a back to the chair, but instead, they have a knee rest. By kneeling on the knee rest and sitting on the seat pad, you will have to sit up straight without the support of a backrest. You will be able to pivot and move around freely so that you can carry out your work as you need to, but your back will not be being propped up by padding and cushioning from a back support. Some experts say that this is a better kind of seat for those who have poor posture as they encourage the user to sit up unaided. In addition, the hips are tilted downwards so that the user does not experience pressure to the lower back, which can often be a problem for those who tilt back in their chair. Both of these alternatives to using office chairs require the user to maintain good posture and can correct any bad sitting habits. Despite this, you should still speak to your doctor before choosing to use either of these alternatives to office chairs, especially if you already suffer from back problems. Check out the best-selling back supports for office chairs online today. When you are sitting in an office chair, you should ensure that you are sitting properly. One of the biggest mistakes that you can make is to sit incorrectly at your desk. For people with office-based jobs, sitting at a desk can require the user to be seated for hours at a time. You should ensure that you are sitting properly to minimize the back pain that you could develop. Choose a chair that will offer as much adjustment as possible. This will allow you to position the chair so that the pressure is removed from your spine. It will also ensure that the chair is the perfect fit for your body. If you suffering from chronic back pain, you should check out the list and learn what are the best office chairs for back pain! When you are sitting at your desk, it is likely that you will be resting your wrists or your forearms on the desk. If your chair has armrests, you should ensure that your arms could rest comfortably on the rests whilst you work. If you find that your wrists are higher than your working surface whilst your arms are on the rests, then you should find a way of supporting your wrists. To avoid pain and strains in your wrists, you should use wrist supports, which are usually made from gel or some other similar kind of cushioning. To ensure that you are comfortable throughout the day, you should choose a chair that has been designed to offer economic features. These features may include a comfortable seat with a padded cushion, high backrest, armrests that are ideally adjustable, adjustable seat height and swivel and tilt features. If you’re thinking about buying a reclining office chair, it’s worth doing a little extra research before spending any money. Here, we’ve done the searching for you!. When you sit on your Office chair, you should be able to read your computer screen without difficulty. Eyestrain can be a big problem for people who use a computer on a daily basis. You should try to prevent yourself from squinting at the screen. If you find that you need to win forward or strain your eyes in order to read what is on your monitor, you should make sure that you make some changes to your computer screen setup. The changes that you could make to your screen include rearranging your desk so that your computer screen is closer to your face. You could also raise the level of the screen using monitor riser. Adjusting the height of your seat or moving the seat pad backward so that you can sit more comfortably in your chair might also help. Is your uncomfortable office desk affecting your work? You should swap your current desk with these top-rated office desks and get tips for working comfortably! Some people like to try alternatives to sitting in office chairs. You could try a standing desk, yoga ball, or a kneeling chair instead of your standard office chair. A standing desk encourages you to be more mobile whilst you are in the office. It will help to maintain good blood circulation as well as dissuading you from having a sedentary lifestyle. People who want to correct their bad posture often use exercise or yoga balls and kneeling chairs. These chairs have no backrests and try to force you to use all of the muscles in your back and to sit up straight. It is very difficult to slouch or to allow your back to curve when you are using either of these kinds of seating methods. You can also discover here the buying guide to find out more about the best desk lamps that will help you create an excellent working atmosphere! Sometimes, something might go wrong with your office chair. If your chair came with a warranty, you may be able to get the part replaced free of charge, however a lot of the time, many users find that the part they need isn’t covered under the warranty. Common parts that can wear out over time include the pads on the arms, seat or back and the levers that are used to adjust the chair. In addition, you may find that the wheels can become worn over time so you may want to replace those too. There are several places where you can purchase these replacement parts but often you are best to contact the place where you purchased the chair from or the manufacturer directly who will be able to advise you on the best course of action to take. As there are so many office chairs available for you to choose from, the office chair reviews will hopefully provide you with some great ideas for choosing the most suitable chair for your desk. Whether you want to recline on your breaks, or if you simply want a chair that is adjustable to your dimensions, there are some great suggestions amongst these reviews. The best chairs to choose for your needs are the ones that offer the most adjustment options. This will ensure that the chair will be a perfect fit for you. As you can tell from this office chair buying guide, however, even if you can’t find a chair that is perfect and within your budget, there are other things that you can do to make the chair more suitable. These office chair reviews give you just a few examples of the kinds of chairs that you have to choose from today. The great thing is, however, that you will be able to find plenty of other chairs on the market if you do not feel that these particular ones will be the best office chairs for you. How to Adjust an Office Chair Properly? Cosy Offices Copyright © 2019. All Rights Reserved. cosyoffices.com is a participant in the Amazon Services LLC Associates Program, an affiliate advertising program designed to provide a means for sites to earn advertising fees by advertising and linking to amazon.com.